Our USDA Prime Porterhouse gives you the best of both exceptional flavors: the hearty flavor of a New York Strip steak on one side and a tender Filet on the other. An impressive cut by all standards, the USDA Prime Porterhouse includes the T-Bone which adds additional richness in flavoring to these generously portioned steaks. 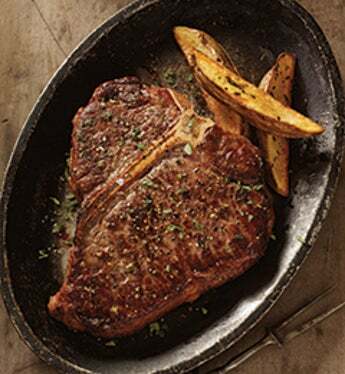 USDA Prime Porterhouse from Stock Yards® is for the serious steak lover's appetite. Our USDA Prime Porterhouse gives you the best of both exceptional flavors: the hearty flavor of a New York Strip steak on one side and a tender Filet on the other.